Another fried rice recipe, this time chicken tenders (part of chicken breast) being main ingredient. 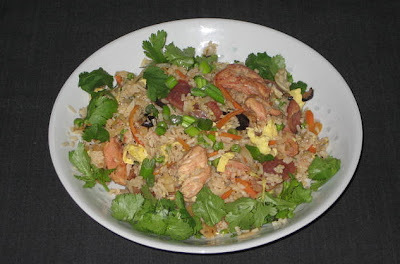 This is very similar to Fried Rice with Char Siu recipe posted last February. Major difference is omission of shrimps and use of chicken tenders in place of Char Siu. § Soak mushrooms in a 1:1mixture of hot water and dark soy sauce, for at least 1/2 hour. Remove stems and cut into 1/4” slices. Reserve 1/4 cup of the water. § Marinate chicken strips, in 1 Tbs. of rice wine, 1 Tbs. dark soy sauce,1/2 tsp. salt, 2 tsp. sugar and 1/2 tsp. white pepper. § Peel and julienne carrots into 1/4” pieces. Parboil for 1 minute in boiling salted water. Drain and plunge into cold water. Drain again and set aside. § Cut green onions diagonally into 1” pieces and separate white and green parts. § Soak frozen green peas in salted hot water for 1/2 hour, drain and set aside. § Beat eggs in a bowl with fork, add salt and white pepper and set aside. § Crush and chop ginger and garlic and set aside. § Break up clumps of cold rice till you have individual grains. Set aside. Stir together all ingredients till well combined. § Heat a wok and add 1 tsp. of oil and spread with steel spatula till sides are well coated. When wok is very hot add eggs and scramble lightly. Remove to preheated bowl, break up the eggs, set aside and keep warm. § Wipe the wok clean, add 1 tsp. of oil and spread with steel spatula till sides are well coated. Sprinkle 1 tsp. of salt and drop in the rice. Stir till rice is evenly coated and grains are separated. Remove to bowl with eggs. § Wipe the wok clean, add 1 tsp. of oil and spread with steel spatula till sides are well coated. Add chicken with marinade and stir-fry for 2 minutes or till cooked through. Remove to bowl with rice and eggs and keep warm. § Wipe the wok clean, add 1 tsp. of oil and spread with steel spatula till sides are well coated. Add garlic and ginger and stir-fry for few seconds then add mushrooms and stir. § Add previously prepared green peas, carrots and white parts of green onions. Stir-fry till well combined. 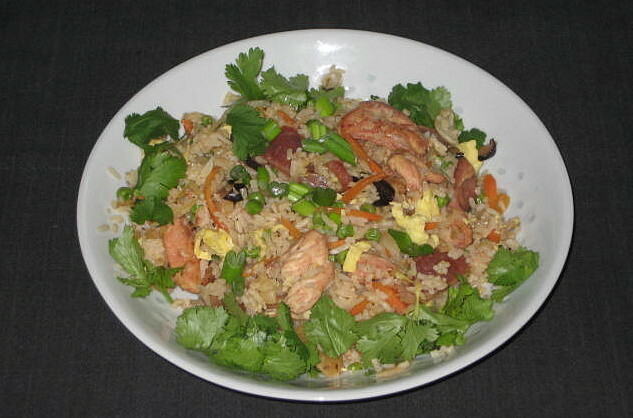 § Add reserved rice, shrimps and eggs and mix well till all ingredients are very hot. § Pour sauce on side of wok and stir. § Serve immediately in individual preheated bowls and garnish with green parts of onions and coriander (optional).